With the Easter bank holiday fast approaching, we’ve popped together this case of mouth-watering Easter treats. Packed with everything you need for the long weekend (except the chocolate, of course! ), this case includes two of Stephens 94% rated Cabernet Sauvignon, a bottle of Angel-favourite Galodoro and Nina's stunning Shiraz blend. Plus, with over £41 chopped off the price tag, and FREE delivery there's no need to brave the bank holiday supermarket crush. Prefer a mixed case? All whites? Hosting the masses? Why not upgrade to our bumper 15 bottle selection? My Reserva is something truly special that shows the best that Portugal has to offer, but still remains incredibly competitive in value. It brings a more complex and serious personality that will please even the most demanding drinkers. Having everyone's support at Naked and witnessing first-hand the positive feedback from Angels is the biggest motivation that I could ever ask for. My approach when making this wine was highly influenced by everything I learned from being part of Naked Wines. Once poured this wine starts oozing complex aromas of red and black fruits mixed with vanilla and some spices. It is a complex wine with soft and velvety notes of ripe fruit. A wine made to drink slowly that will offer you a rich and lingering aftertaste. This is it. Our best-selling red wine of all time... 92% of the 74,000 odd Angels that have tasted it would happily buy it again. Think pure, unadulterated blackcurrants, mixed in with a judicious chunk of oak, with a streak of Bertie Basset running naked through it. It's an absolute cracker. 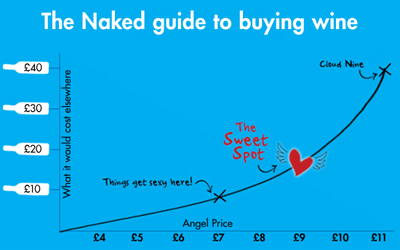 And because your Angel funding supports Stephen, you get it for a frankly silly price! Ruth and Ana love making wine, they love making interesting and delicious wine and they love making wine that you can drink any day of the week. Thanks to Angel funding, they got to make this beauty, just for you. Super soft and full of bright, fresh red fruits, it’s like biting into a ripe, juicy plum! Dangerously quaffable with just a hint of spice from the Spanish sunshine. When you’ve popped the kids in bed and you need your well deserved sofa time, crack open a bottle of this. You won’t regret it! Having lived here for 20 years, I think Corbieres may be one of the most unspoilt areas of France. I wanted to make a wine that reflected the beauty yet wildness of this area. To show that with a little care and attention it was possible to come up with a superior style packed full of the fruit, wild herbs and individual character of the area. Angels voted in their masses for this wine during the Summer Tasting Tour to make my dream a reality. I thought I had something rather special but it is great to have the 'yes' vote from the Angels. I am a sucker for the traditional rustic Carignan grape and in this wine it is balanced perfectly with the graceful Syrah and fruity smooth Grenache. The fruit is dark and ripe with notes of wild herbs - rosemary, thyme, pepper and liquorice! The barrel ageing helps to soften the wine and control the wild rustic character. Mário Negreiros has been working his little cotton socks off on his latest project - made possible thanks to your Angel funding. From the first sip of this huge, full-bodied red, think of the freshest, most succulent black cherry you’ve ever scoffed, with just a rumour of pepper and dark chocolate on the finish. Then double it. As the ultimate thank you, Mário even named this vintage ‘Nu’, which means ‘Naked’ in Portuguese. It’s a wine he’s made specially for you, with love. Ahhh. To get the best out of this wine, Mario recommends decanting it for 1-2 hours before drinking... why not add a Schott Zwiesel Decanter to your order?